Ernie Sapiro has photographed a who’s who of Northwest music personalities, from Sir Mix-A-Lot to Mike McCready, Merrilee Rush to Jini Dellaccio. Sure, that’s Sean Kinney from Alice in Chains, but we’re not pointing that out. And yes, that’s Sir Mix-A-Lot in his signature chapeau, but we’re not making a big deal about him, either. Some of the faces that appear in Ernie Sapiro’s “Musician” photography exhibit are well-known, or wealthy, or in the studio as we speak. But here they are simply musicians. People who have made music the center of their lives here in the Northwest, whether it’s playing it, producing it, promoting it, putting it on the radio or writing about it. Money and magazine covers have no currency here. 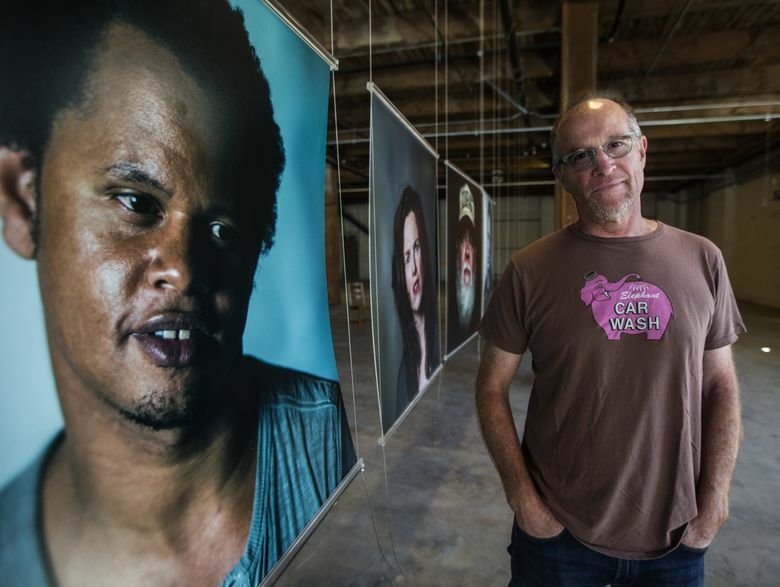 The portraits are 30”-by-34” and are suspended from wires that hang from water pipes that run across the high wooden ceiling of the Stables, on Western Avenue just north of the Pike Place Market. The space — donated for the exhibit — carries as much Seattle history as the musicians being featured. The building was completed in 1910 and housed 300 horses that pulled Seattle’s street cars and fire trucks. It is listed on the National Register of Historic Places. The portraits are of people involved in all aspects of music: DJs like KJR’s Pat O’Dayand John Richards of KEXP; Easy Street Records owner Matt Vaughan; Visqueen frontwoman Rachel Flotard; singer Dusty Bishop; and Sub Pop Records co-founder Jonathan Poneman. If he weren’t behind the camera, Sapiro, 59, could have been one of the subjects. But when he asked for his own, his mother gave him a saxophone instead, saying it was a “real instrument “— and his lessons started that Monday. When he was 18, Sapiro turned his sax in for a guitar and three years later, joined the first of three bands: The Lonesome City Kings, the Cowboys and The Moberlys, who would go on to open for The Police and Blondie. All the while, he kept a janitor job at the original Red Robin on Portage Bay because it allowed him the freedom to tour. But in his thirties, Sapiro decided “I didn’t want to be broke anymore,” and became a restaurant manager. Five years ago, he started doing commercial photography, following in the footsteps of his father, who had an office in New York City’s Carnegie Hall and who photographed The Beatles when they played there in 1964. Not long after he started shooting musicians for “Art Zone,” Sapiro was asked to shoot a portrait of Gary Minkler of the pre-Grunge band Red Dress, who was putting out a solo CD. Sapiro set up a gray background and two lights in his garage, and invited Minkler over. When they finished, Minkler picked up his guitar and played a private concert. When it came to choosing subjects, they made lists and lists. It would have been nice to get people like Ann and Nancy Wilson or Eddie Vedder, but it wasn’t imperative, Guppy said. The majority of the portraits were taken in the Gibson Showroom, where Sapiro was given studio space. He put everyone on a stool about seven feet away and talked while he shot about 150 photos of each person. He asked about guitars and childhoods, projects and tours. He asked Lynn Sorensen of Bad Company what it was like to play Wembley Stadium. He talked about Roosevelt High School with Mike McCready of Pearl Jam. Kathy Moore from The Guessing Game screamed. Kinney cursed a lot. Randy Hansen did a lot of stuff with his tongue. Sixties star Merrilee Rush said sure, she’d be photographed. But she didn’t get up before 3 p.m. and, once she arrived, she told the filthiest jokes. “I’m thinking, ‘Hey, you’re Merrilee Rush! “Angel of the Morning!” Cut it out!,’” Sapiro said with a laugh. There was only reverence, though, when legendary rock photographer Jini Dellaccio Jini Dellaccio came in to be photographed just eight months before her death. She arrived in a wheelchair, with an aide beside her, wearing a cowboy hat. She told stories about Neil Young and the Sonics, and then asked Sapiro if she could hold a guitar. He happily took one off the wall of the showroom. In her honor, he used the same emulsion on Dellaccio’s portrait that she used to shoot the Sonics album covers. The project is being funded through Friends of Art Zone, a nonprofit Guppy formed with her producer, Sheila Mullen. Their first project was a documentary on the Hedgebrook writing retreat on Whidbey Island. The photographs will be sold, and the proceeds will go to Friends of Art Zone and MusiCares.